Yesterday, media reports surfaced that the U.S. military is considering using aircraft and ships to directly contest Chinese territorial claims in the South China Sea. The reports come amid a broader conversation that has been taking place in Washington over the inadequacies of the current U.S. response to China’s growing assertiveness in the South China Sea, and what a more robust approach might look like. Why does the United States need such an approach? As more proposals begin to surface publicly in the future, it is important to articulate the case for a bolder U.S. South China Sea policy in the first place. Without a clear idea of why such a policy is needed, there is a risk of becoming too bogged down in the merits of individual proposals without understanding their broader significance and relation to U.S. interests. Such a case should address four points: the extent of U.S. interests in the South China Sea; the inadequacies of the current policy; what a more robust approach would involve; and how to respond to arguments against this course of action. First, the United States has a deep interest in the South China Sea. It is not just its geostrategic importance as the center through which a third of world trade passes in a region that accounts for over a third of global economic output. The more important point is that China’s actions in the South China Sea — including invasive patrols and encroachments into waters of other claimants, the seizure of features, and vast land reclamation activities — undermine America’s interest in a free, stable and secure Asia-Pacific. Some of the other claimants have taken or are taking efforts to fortify their claims, but Beijing’s actions dwarf them considerably. Chinese behavior is a threat to rules and norms governing maritime boundaries and resources, freedom of navigation, and the peaceful resolution of disputes. As U.S. Assistant Secretary of State Daniel Russel put it, “the South China Sea is not about rocks; it’s about rules.” It also negatively affects U.S. allies and partners which are one of the key foundations for America’s presence in the Asia-Pacific. Lastly, the South China Sea is an important test case for how the world and its only superpower can deal with the more troubling aspects of a fast-rising China while preserving the other dimensions of their ties with Beijing. Second, current U.S. policy has not worked thus far. The Obama administration does deserve credit for a string of moves over the past year or so to respond to China’s attempt to change the status quo in its favor — including enhancing the capabilities of key U.S. allies and partners; speaking out against China’s reclamation activities; publishing a State Department study questioning Beijing’s nine-dash line claim; and supporting the Philippine case against China. However, the fact is that these moves have neither significantly altered Beijing’s conduct nor sufficiently reassured key Southeast Asian states. China continues to accelerate its extensive reclamation activities in the South China Sea, ignore international law, and drag its feet on a binding code of conduct with Southeast Asian states. Some U.S. measures also require time that Washington does not have because China is changing the status quo so quickly. Given this, it is clear that additional measures ought to be considered to achieve American objectives. Third, there are additional initiatives that can accomplish U.S. objectives without significant additional cost or necessarily provoking all-out conflict with China. To clarify, the key objective of a more robust approach is to make clear to Beijing that its unilateral attempts to change the status quo are illegitimate and carry demonstrable costs, something that Washington has done more effectively in the East China Sea than the South China Sea. For instance, the proposal to use U.S. aircraft and ships to directly contest Chinese claims in the South China Sea — much like the U.S. effort to fly two unarmed B-52 bombers through China’s air defense identification zone in the East China Sea — would be a firm demonstration that Washington does not recognize the legality of Beijing’s claims. Another measure would be clarifying American commitments to the Philippines, the only U.S. treaty ally in Southeast Asia involved in the South China Sea disputes. Given the recurring debate about what the alliance covers, a public statement of some sort on how Washington would respond to further Chinese seizures of Philippine features or assaults against Philippine troops in disputed waters — analogous to the reassurance Washington gave Tokyo on the Senkakus — would send a powerful message to China and the region more generally about where Washington stands. This is particularly so it if is accompanied by other positive developments in the U.S.-Philippine alliance, including the the passage of the Enhanced Defense Cooperation Agreement Washington has inked with Manila, which would give Washington greater access to facilities near the South China Sea. Fourth, many of the counterarguments to adopting a more robust approach are rather weak or unsatisfactory. Some have warned that Washington should be wary of damaging its prized relationship with China. But preserving one bilateral relationship does not mean failing to respond to actions that undermine stability, rule of law, and freedom in the Asia-Pacific, the very foundation on which the region’s prosperity — including China’s — has been built over the past few decades. Furthermore, relationships ought to work both ways, and Beijing cannot continue to take actions that undermine U.S. interests and expect Washington to not respond decisively to stop them. It is worth noting, for example, that China has already taken or mulled some ‘risky’ moves that the United States is now considering. U.S. officials point out that China sent vessels to the Senkaku Islands in the East China Sea to demonstrate to Tokyo and others that it does not recognize them as Japanese territory. There have also been discussions in Beijing about how to coerce an adversary aligned with a great power, using U.S. allies Japan and the Philippines as case studies. Other have stressed that the United States should be careful to only take steps that it is prepared to support, lest it suffer a blow to its credibility as with the infamous Syrian red line. Yet as was mentioned earlier, in this case, many of the proposed measures do not involve a significant amount of U.S. blood or treasure and are actions that Beijing has itself taken or mulled without conflict thus far. And while some of them do admittedly involve a greater degree of risk, the U.S. interests at stake and the failure of current policy makes a more robust approach necessary to make clear to Beijing that its behavior is illegitimate and carries demonstrable costs. 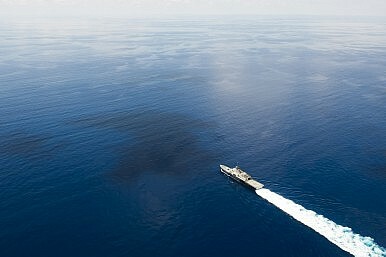 Furthermore, there is no reason why Washington cannot pursue a more robust approach to the South China Sea while also trying to improve relations with Beijing where possible and ensuring that it consults its relevant regional allies and partners despite their differing priorities and concerns. Suggesting that such an approach is inherently incompatible with these other considerations is a vast oversimplification that ignores the complex realities of our world and the finesse required in dealing with it.